address or send a 3.5" disk. on the 'Exit Game' icon. cast and that the spell target should be selected. 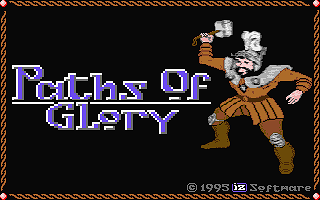 To start Paths of Glory double click on POG.PRG. game scenarios and previous game positions loaded. 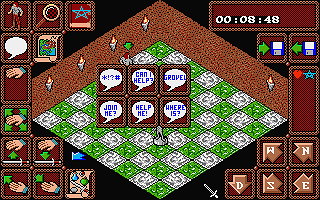 explore) and a player character must be loaded prior to starting. Exit Game - exits the game and returns back to the desktop. previous playing session. Saved positions have a .SAV file extension. have a .CHR file extension. 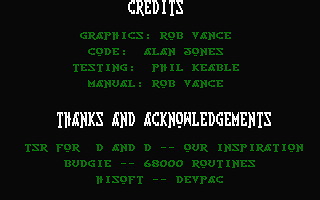 displayed on the main menu / character designer screen. Roll Character - rolls random  statistics for a new character. Class Type - changes the current character class type. characters that can use magic, i.e. warlocks, priests and elves. the attribute through training, although this costs money. 1. From a saved game position. previously saved game. This loads in all files necessary to play, i.e. game automatically starts when this option is selected. 2. From a new scenario. button or creating a new character as detailed below. 1. 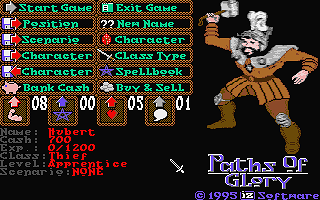 Select a character class. 2. Roll character attributes and money. character attributes and starting money  for  use in buying equipment. 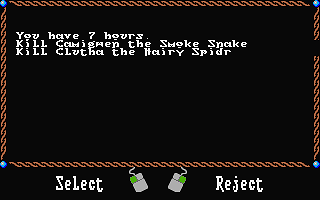 randomly chosen character name for one of your own. and shields), torches and lanterns, and food (apples, bread and meat). items for sale will vary from scenario to scenario. object added to your character's inventory. the right mouse button exits the inventory display. cast by any magic-using character. may be cast by priests and elven spells may be cast by elves. to pay for the training a beep will sound. shop. Right click when you are finished. continue at the point where you left off. actions see the 'Game Controls' section. your character and monitor their status. 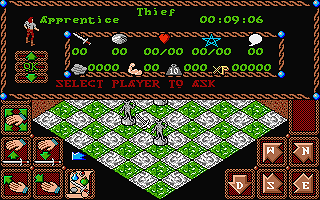 o       A picture of the character, their name and race type. o       The current amount of time spent in the dungeon. better you chance to hit monsters. better protected you are from attacks. magic points you have left. strength. The higher this number the stronger you are. maximum depends on your strength. room for hidden treasure and items but this takes time to do. o       Spell. This is the name of the spell. o       Level. 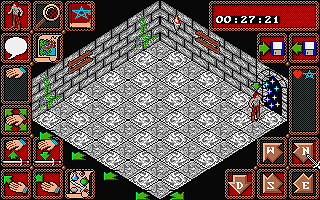 This is the level or difficulty of the spell. spell is aborted by right clicking, the spell is lost. allow you to control how  to  talk  to  other characters and monsters. displayed with all characters and  monsters  in your current location. monsters to talk to and left  click  the  'OK' button to talk to them. return for which you may get a reward. receptive to a request to join you. character or monster whose name you give. location is shown by the green marker. so is normally a weapon. the 'Held Object' icon space. 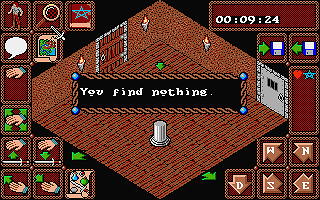 your inventory of objects using the 'Inventory' icon. select an item that is currently worn to remove. door lock when facing a locked door. allows you to select an object to light or extinguish. of the dungeon but their life is limited. return for it at a later time. the item is added to your inventory. item you wish to drop. monsters if you stand facing them. only be taken from characters or monsters if you stand facing them. cycle through the objects available. exit the game and return back to the desktop. 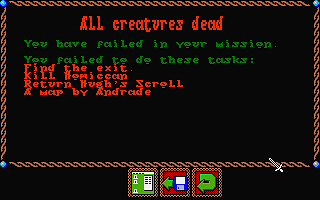 this screen when the scenario has been completed. points that your current character possesses. movement icons you will attack in that direction as well as moving. 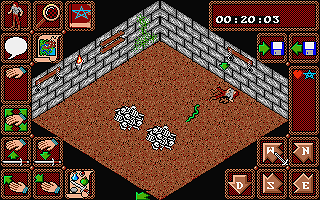 A number of game controls are also available via the keyboard. To display a help screen listing all keyboard shortcuts, press 'H'. cannot perform any actions until they have eaten or drank. enchanted weapon displayed as appropriate. and will not permit passage when your life points are very low. other characters and monsters, which you will then be able to control. in order to control the combat with the attacker. 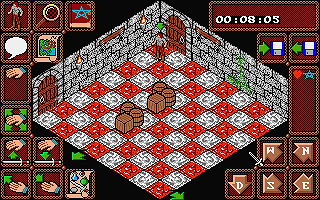 The exit from the dungeon is indicated by a ladder leading up. character will not be saved. menu / character designer screen as detailed above. Glory before using any other programs.